The Chronicle of the Czechs by Cosmas of Prague (d. 1125) is a masterwork of medieval historical writing, deeply erudite, consciously researched, and narrated in high rhetorical style. 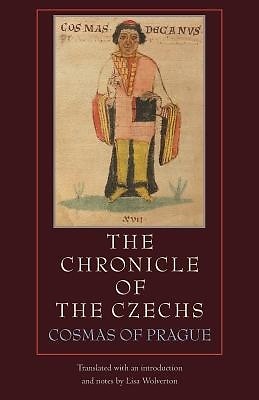 Regarded as the foundational narrative of Czech history, it is the source of the oldest stories about the land, people, and rulers of Bohemia and Moravia. Lisa Wolverton provides the first annotated English translation of this eminently enjoyable and teachable work. The first of the three books of the Chronicle describe the earliest people to arrive in Bohemia, the first rulers and the origins of the Premyslid dynasty, the founding of Prague, and the early phases of Christianization. Book Two covers the period from 1037 to 1092, the age of Duke Bretislav I and his five contentious sons. Book III treats events contemporary with the author's writing, a time of great political upheaval, both internally and in relation to neighboring Germans, Poles, and Hungarians. Preeminently concerned with rulers and political life, the chronicle is striking for its narrative brilliance, vivid characters and scenes, dramatic dialogues, evocative soliloquies, and deep classical and Biblical erudition. In composing it, Cosmas sought to define the Czechs as a nation through history, compel them to think about their political culture, and urge reform, justice, and responsibility. The oldest history of a Slavic people written by a Slav, the work rivals any medieval chronicle in its verve, accessibility, and insight into the very nature of political power. The Chronicle of the Czechs will be indispensable for medieval specialists wanting to extend their reach into Eastern Europe, as well as for college instructors in search of a lively and insightful text on medieval political life generally.